Maine is a proper noun. Maine is (1) a state in New England. The following articles provide more information about the proper noun Maine. The capital city of Maine is Augusta. Learn about the Maine state government, including its agencies and operations. Read about living and working in the Pine Tree State, and find Maine travel information. Learn about urban, suburban, and rural real estate markets in Maine. Real estate agents, buyers, and sellers will appreciate the Maine real estate resources on this page. 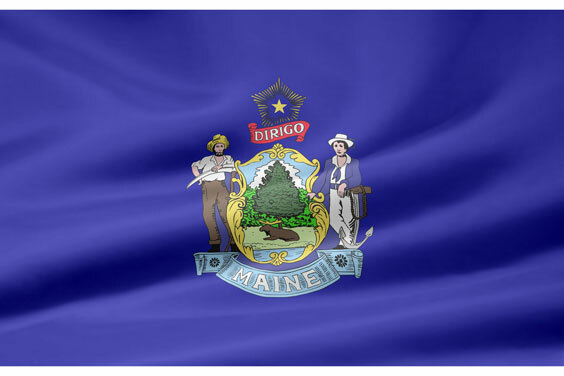 Maine is the 39th largest state in the USA; it is bounded by the Canadian provinces of Quebec and New Brunswick to the north, the state of New Hampshire on the southwest, and the Atlantic Ocean on the southeast. Maine state history, geography, and travel information are the subjects of this Maine atlas page. This National Park directory page lists National Parks, Historic Landmarks, and Natural Landmarks in the State of Maine. An interactive Maine map, plus photos and highlights, are included thereon. This public research university, located in Orono, Maine, was established in 1865 as a land grant college. It is the flagship university of the University of Maine System. Bar Harbor is a picturesque small town in southeastern Maine that is located on the northeast shore of Mount Desert Island. Nearby Acadia National Park contains Cadillac Mountain, the highest point on the eastern seaboard. New England has some popular tourist destinations. To learn about the attractions in each state in the area, read this informative website. Down East is the magazine of Maine. It includes articles on the culture, food, travel, and real estate of Maine. It's an interesting magazine for anyone who likes or wants to visit Maine. New Hampshire is the 44th largest state in the United States. It is bounded to the north by the Canadian Province of Quebec, to the south by Massachusetts, to the west by Vermont, and to the east by Maine. There are plenty of excellent surfing spots located on the Atlantic Ocean along the East coast. Learn about them here and find links to surf shops from Maine to Florida. Contains biographical information about the artist, Dana Professor Emeritus of Art at Bates College. Website includes paintings, drawings, and etchings. Lent maintains a studio in New Hampshire and exhibits in galleries in Maine and New Hampshire. An early version of MoveOn was begun in 1998 in California, but in 2001, Eli Pariser of Maine began another organization aimed at promoting restraint in our response to 9/11. Pariser later joined forces with the California group. Today MoveOn has more than 3 million members who receive updates by email about events and issues in the current political climate. L.L. Bean is an American company that markets its merchandise online, through mail-order catalogs, and retail stores. It is based in Freeport, Maine, United States with retail and outlet stores located throughout the Northeast. L.L.Bean specializes in a variety of clothing, shoes and boots, and outdoor recreation equipment. Founded in 1898, the Old Town Canoe Company made wood and canvas canoes in Old Town, Maine. In 2004, the company was acquired by Johnson Outdoors, and today, this reputable enterprise offers a good selection of both canoes and kayaks. The following articles provide recent Maine-related news. Lots to love about this one-of-a-kind hideaway. By Laura Manske, Contributor. Forbes. Tuesday, 23 Apr 2019 17:23:00 +0000. Vermont and Maine are the latest states reconsidering Christopher Columbus's legacy by voting to permanently replace Columbus Day with Indigenous Peoples' Day. Michele Debczak. Mental Floss. Monday, 22 Apr 2019 13:10:00 -0400. APNewsBreak: At least 22 former Maine lawmakers registered as lobbyists within months of leaving office in the past three decades. ABC News. Sunday, 21 Apr 2019 14:20:26 -0400. Washington Times. Saturday, 20 Apr 2019 12:47:14 -0400. Military officials say they're investigating the shooting death of a 21-year-old Marine corporal from Maine in South Carolina, and say they have another Marine in custody. Fox News. Tuesday, 16 Apr 2019 14:46:21 GMT. CBS News. Wednesday, 10 Apr 2019 09:00:04 +0000. CBS News. Tuesday, 09 Apr 2019 19:45:02 +0000. Hsyndicate. Thursday, 04 Apr 2019 10:55:20 +0200. There must be something in the drinking water at Maine Medical Center, where nine of its maternity nurses are all pregnant and expecting to give birth in the next couple of weeks. Newsmax. Friday, 29 Mar 2019 13:00:21 EDT. The following digital image illustrates the proper noun Maine.